Archer Engineering manufactures custom and standard screws with diameters from ¼” to 4”. When standard screws do not meet project requirements we manufacture custom specialty screws depending on the application. Requirements that change standard screws to special are material, dimensional lengths, thread pitches and thread direction. Common standard screws we manufacturer include slotted flat countersunk machine screw, cross recessed flat countersunk head machine screw, slotted pan head machine screw, hex head machine screw and slotted round head machine screw. 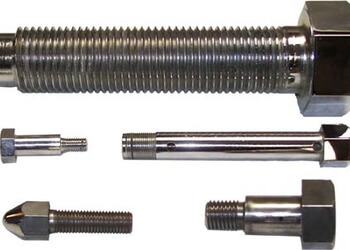 Screws are usually parts that have a head with a smaller body diameter that is threaded. In general, screws are smaller in size than bolts, generally up to 3/4" in diameter. Heads can be a variety of shapes including round, square, and hex. The most common head style is round since the diameter of the screws are small lengths they tend to be proportional. Any project or application that has a holding requirement uses screws. Common industries include appliance manufacturers, automobile manufacturers, military, aerospace, power generators, and oil and gas. Common materials are low carbon steel, 300 series stainless steel, brass, bronze aluminum and plastics. When additional requirements are needed material changed may be made to an exotic material. Some examples could be high temperature stainless steel, high strength stainless, Inconel, Hastelloy, and Monel. At Archer Engineering our experienced staff will guide you through the process of selecting the right material and manufacturing process depending on your parts specifications. To maintain top quality and performance of end products, industry standards used for manufacturing and inspections include SAE (Society of Automotive Engineers), ASTM (American Society of Testing Materials), IFI (Industrial Fastener Institute), ASME (American Society of Mechanical Engineers) and Military specifications.